Woman at a street protest in Khartoum, Sudan 2019. Photo courtesy of Noor Ali. Sudanese women are fighting back against the Islamist state of Sudan after 30 years of oppression and humiliation. Major hikes in basic living costs sparked protests in December as the country faced its worst economic crisis in decades. Poor families were hit at the core, and women who put food on the table spoke out through WhatsApp and Facebook and rallied the people to defy the authoritarian regime. Women continued to lead peaceful street demonstrations, call for civil disobedience actions and take to social media in protest. Doctors, lawyers, students, teachers, and stay-at-home mothers have been steering the #SudanUprising for three months now, in the most sustained revolt against the regime in recent history. But women’s leadership, as is the case in countless countexts, is rarely recognised in the media. When it is reported, women are seen to have “joined” protests – rather than being represented as leaders. ‘Zagrouda’ (or the women’s chant) has become the calling code for every protest in the street. When people hear these women’s voices, they know it’s the revolution call and that it’s time to start their march. Women and men have both gathered and courageously faced live ammunition, tear gas, and heavy metal sticks in their backs. But most male protesters would openly tell you that it’s the women on the frontline who’ve encouraged them to keep marching. This is intricately connected to the Sudanese local culture, as women historically sang and wrote poems to support men during wars. Yet, there’s a modern, more feminist twist to this traditional role, as women have come from the back lines to take leadership roles during these protests. Women blocking roads at protest in Khartoum, Sudan 2019. | Photo courtesy of Noor Ali. It’s also no surprise that women are leading the fight against Sudan’s Islamist government, as Sudanese women have always been the first enemy of the regime’s political religious fundamentalism. Public order laws and personal laws imposed since 1991 have prevented women from wearing what they want, working or even walking on streets as they want, while stipulating restrictive rules like ‘male guardianship’ and ‘wife obedience’. What’s more, the Sudanese president Omer Al Bashir has been charged by the international criminal court for crimes against humanity, particularly for his role in orchestrating mass rapes during the war in Darfur in western Sudan. Despite a warrant issued for his arrest, he has continued to travel freely, including to China, Egypt, Jordan, Kenya and Saudi Arabia, revealing a global network of states and leaders turning a blind eye to Al Bashir’s abuses of women’s human rights. There is also a regional context to the #SudanUprising that must be understood. In 2015, Women Human Rights Defenders (WHRDs) from the Middle East and North Africa (MENA) region founded the new WHRDMENA Coalition to provide solidarity and support, to learn from each other, and most importantly to amplify one another’s voices when states so often try to silence us. 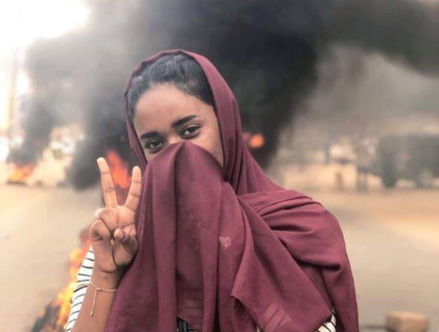 Sudan’s regime has clearly followed the example of the Egyptian state by targeting women activists through travel bans, asset freezing and judicial cases against them. It’s also followed in the footsteps of Saudi Arabia through detaining activists and denouncing “those who conspire” against the state and “seek to attack it”. Government forces have also attacked hospitals and doctors who’ve attempted to heal protestors, while interrogating and censoring journalists reporting on the protests – labeling them “agitators” for “incitement of hatred against the state”. Most recently, on 22 February, Al Bashir announced a new one-year state of emergency to extend security authorities’ powers to detain protesters and crackdown on public gatherings. Still, women’s protests show no signs of abating. The WHRDMENA Coalition is aware of at least 45 women activists in Sudan who have been put behind bars over the last three months. These include Ihsan Al Fagiri, founder of the No to Women's Oppression Initiative human rights group; the prominent WHRD Hanadi Fadol; Doctor Heba Omer and Adeela Al Zaebaq, president of the Sudanese Women’s Union – who were among the 40 women released from prison on 8 March, International Women’s day. The day before, on 7 March, hundreds of women took the streets in Khartoum to demand the release of all detained WHRDs and stand against the religious fundamentalist regime and the Muslim brotherhood. We deliberately marched on a Thursday, not a Friday (the Muslim holy day), as is the tradition in MENA countries, and as protestors did during the Egyptian revolution. Women leading protests in Khartoum, Sudan 2019. | Photo courtesy of Noor Ali. 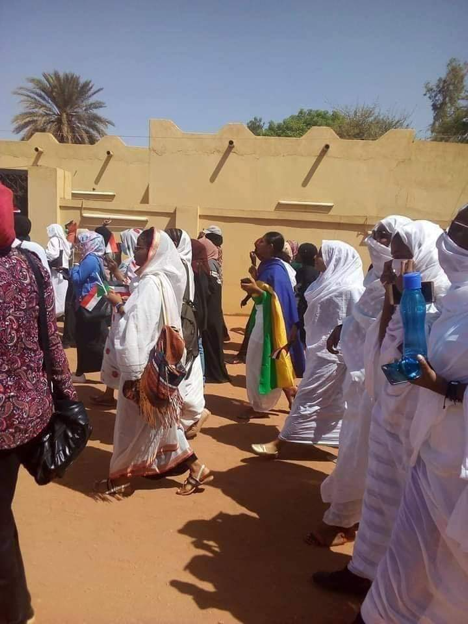 On 8 March itself, the women still detained in prison in Omdurman, Sudan’s second largest city, launched a hunger strike to protest their imprisonment and demand an end to Al Bashir’s regime. 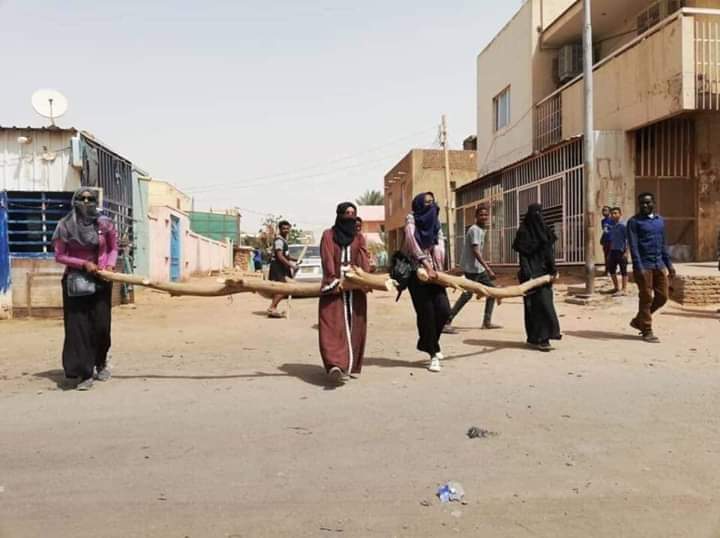 Groups of young women are also organising and leading protests including those that began on campus at Ahfad University for Women and then led to thousands demonstrating in Sudan’s capital, Khartoum. Meanwhile, women in the Sudanese diaspora have been organising solidarity protests from Washington DC to London to Dusseldorf. Despite the apparently positive news of the International Women’s Day releases, just one day later, on 9 March, nine other women were sentenced to 20 lashes and sent to jail under the regime’s recently-enacted emergency laws. Two sisters, Meriem and Rabbah Alsadiq were also detained the following day. Meriem is vice president of The National Umma Party (a political party opposing the regime). Meanwhile, the backlash against women human rights defenders in Sudan has also gone online, with security agents who have shamed specific women on the internet calling them ‘prostitutes’ for taking to the streets. Some of these women have also documented being subjected to various forms of violence during demonstrations, and in prison – including disclosures of sexual violence intended to intimidate them and push them away from the public sphere, and from the protests. This cruel repression of women activists in Sudan must not be seen as part of some unstoppable regional pattern echoing Egypt and Saudi Arabia. This time, women must win. The world must stand up for these courageous activists who are dismantling the unjust structures in place in Sudan. You must hear these women and listen to them. We will not be silenced.